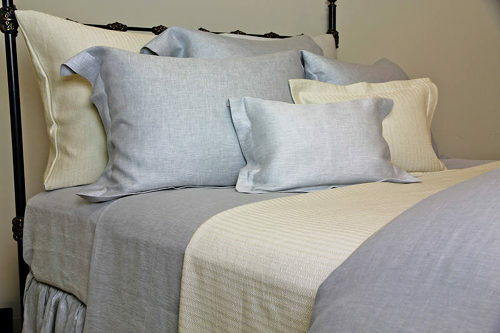 The luxurious SDH Jazz is a beautiful blend of 65% Egyptian cotton and 35% silk. Shown in the photo in the duvet cover, the collection also includes shams, covers, pillow cases, and bed skirt. This collection is offered in the color, Caviar, a deep rich grey and this seasons hottest color. 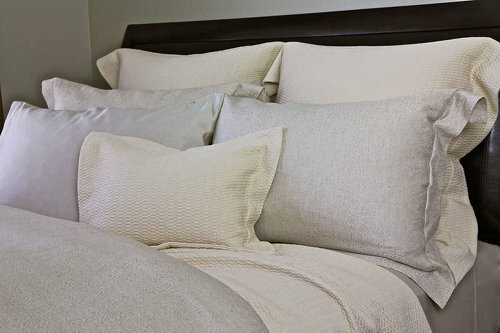 The Mandalay collection from Peacock Alley in linen offers clean lines and the softest colors of Moss, Khaki and Mist. Constructed of 100% linen and made in the USA. 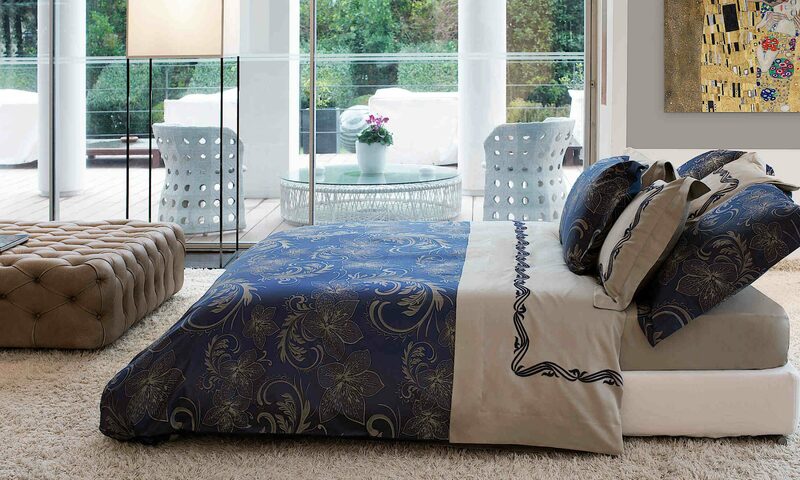 The collection includes Duvet Cover, Bed Scarf, Shams, Decorative Pillow, and Tailored Bed Skirt. 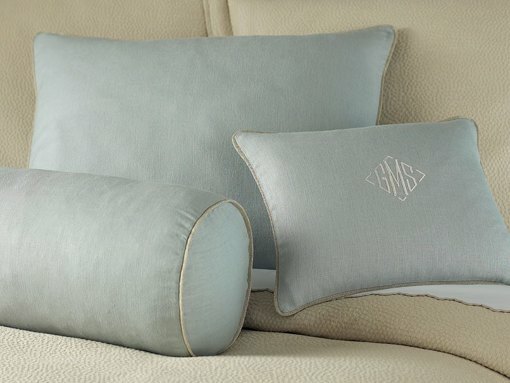 Handcrafted decorative pillows from Kevin O’Brien will bring a unique decorative touch to any room in your home. Each fabric starts with a sketch and then follows a meticulous process to transfer the design onto the fabric. Dyes are mixed in customized colors and several layers are applied to give each design its unique appearance. 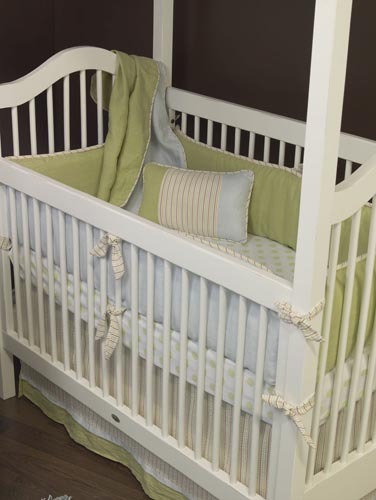 The Tori crib bedding collection from Maddie Boo marries a solid light blue with a solid celery green with accents of a gentle stripe fabric. 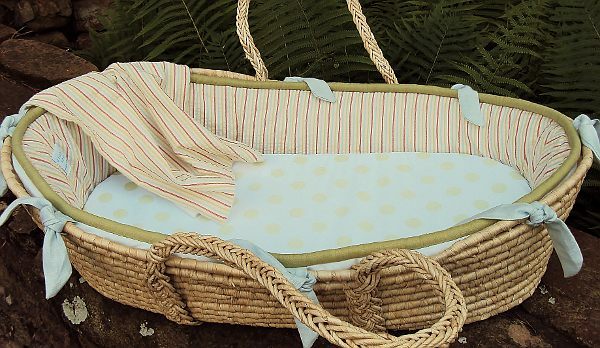 This gender neutral baby bedding would look great in a nursery painted in a rich chocolate brown. Imported from Portugal, the Overture sheeting collection from Peacock Alley is 100% Egyptian cotton with a large scallop detail. Available in white or ivory, these 300 thread count sheets are a great basic for the well made bed. 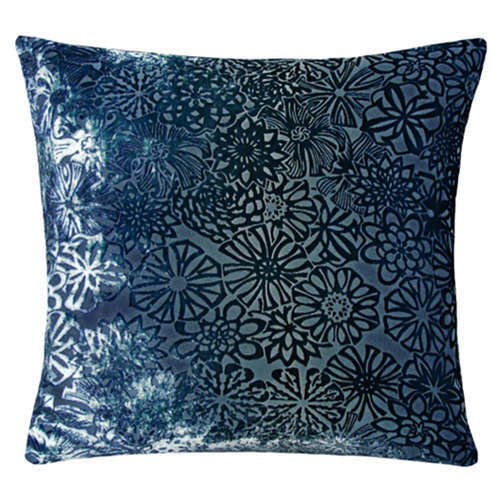 These luxurious Kaleidoscope throw pillows from Kevin O’Brien are made with hand-painted silk and rayon velvet and are available in 10 luscious colors. All pillows come with a feather/down insert. 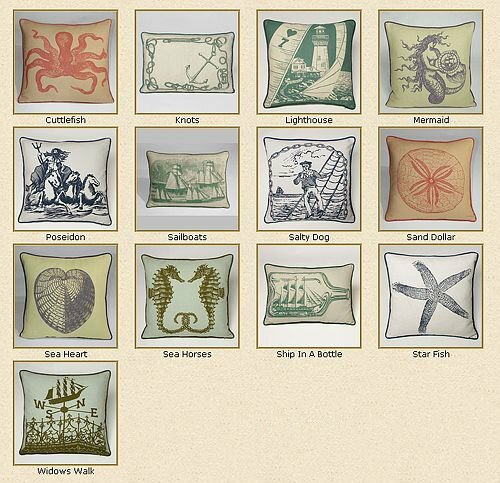 Nautical lovers will love this series of pillows from Kevin O’Brien Studio. Mythical figures, sea life, sail boats, and more are part of this collection. Printed on 100% linen. Each available in five color choices. A new introduction from Kevin O’Brien. 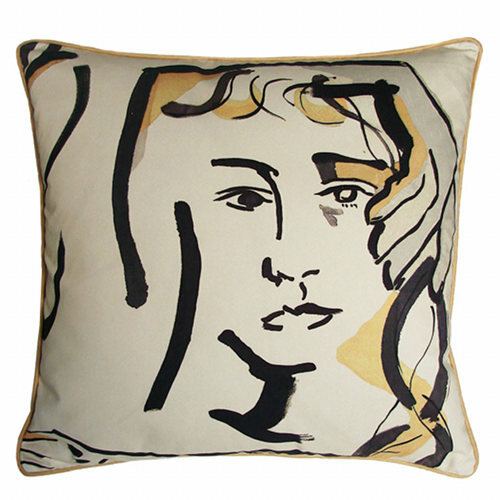 Offered in 4 styles and two colors, the Faces series of contemporary art pillows is sure to be a conversation piece. 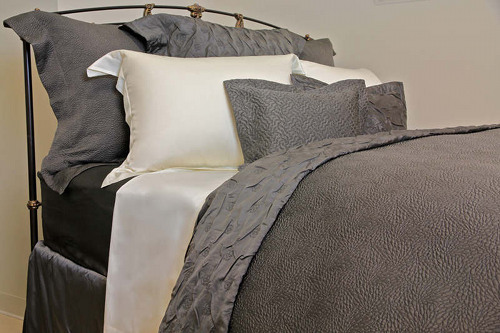 A gorgeous bed covering with texture and natural fiber coloring, the SDH Purists Corfu collection includes a duvet cover, coverlet, shams, and decorative pillows. As with all Purist bedding, no chemical dyes are used. 730 Threads per square inch. As soft as a favorite sweater, the Emma cover and shams by SDH is 45% wool / 40% Egyptian cotton / 15% linen. Available in three colors: Stucco, Rye, and Dove. Coordinates beautifully with many SDH sheeting collections.